This article is about the Matabele people. For other uses of the terms Ndebele or Matabele, see Ndebele. The Northern Ndebele people (Northern Ndebele: amaNdebele) are a Bantu nation and ethnic group in Southern Africa, who share a common Ndebele culture and Ndebele language . The Northern Ndebele were historically referred to as the Matabele which was a seSotho corruption of 'Ndebele'. Their history began when a Zulu chiefdom split from King Shaka in the early 19th century under the leadership of Mzilikazi, a former chief in his kingdom and ally. Under his command the disgruntled Zulus went on to conquer and rule the chiefdoms of the Southern Ndebele. This was where the name and identity of the eventual kingdom was adopted. During a turbulent period in Nguni and Sesotho-Tswana history known as the Mfecane or "the crushing", the Mzilikazi regiment, initially numbering 500 soldiers, moved west towards the present-day city of Pretoria, where they founded a settlement called Mhlahlandlela. The Great trek in 1838 saw Mzilikazi defeated by the Voortrekkers at Vegkop after which he was exiled into present-day Zimbabwe where the Ndebele overwhelmed the local Rozvi, eventually carving out a home now called Matabeleland and encompassing the west and southwest region of the country. In the course of the migration, large numbers of conquered local clans and individuals were absorbed into the Ndebele nation, adopting the Ndebele language and culture. Historically the assimilated people came from the Southern Ndebele, Swazi, Sotho-Tswana, and amaLozwi/Rozvi ethnic groups. They were originally named Matabele in English, a name that is still common in older texts, because that is the name as the British first heard it from the Sotho and Tswana peoples. 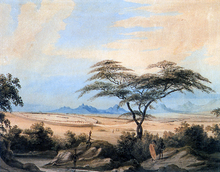 In the early 19th century, the Ndebele invaded and lived in territories populated by Sotho-Tswana peoples who used the plural prefix "Ma" for certain types of unfamiliar people or the Nguni prefix "Ama," so the British explorers, who were first informed of the existence of the kingdom by Sotho-Tswana communities they encountered on the trip north, would have been presented with two variations of the name, first, the Sotho-Tswana pronunciation (Matabele) and second, the Ndebele pronunciation (Ndebele or AmaNdebele). They are now commonly known as the "Ndebele" or "amaNdebele" (and were officially known as the Matabele when under British rule). Another term for the Ndebele Kingdom is "Mthwakazi" and the people are referred to as "uMthwakazi" or "oMthwakazi". The Khumalos were caught between the Ndwandwe led by Zwide and the Zulus led by Shaka. To please the Ndwandwe tribe, the Khumalo chief Mashobane married the daughter of the Ndwandwe chief Zwide and sired a son, Mzilikazi. The Ndwandwes were closely related to the Zulus and spoke the same language, Nguni, using different dialects. When Mashobane did not tell Zwide about patrolling Mthethwa amabutho (soldiers), Zwide had Mashobana killed. Thus his son, Mzilikazi, became leader of the Khumalo. Mzilikazi immediately mistrusted his grandfather, Zwide, and took 50 warriors to join Shaka. Shaka was overjoyed because the Khumalos would be useful spies on Zwide and the Ndwandwes. After a few battles, Shaka gave Mzilikazi the extraordinary honour of being chief of the Khumalos and to remain semi-independent from the Zulu, if Zwide could be defeated. This caused immense jealousy among Shaka's older allies, but as warriors none realised their equal in Mzilikazi. Mzilikazi collected all intelligence for the defeat of Zwide. Hence, when Zwide was defeated, Shaka rightly acknowledged he could not have done it without Mzilikazi and presented him with an ivory axe. There were only two such axes, one for Shaka and one for Mzilikazi. Shaka himself placed the plumes on Mzilikazi's head after Zwide was vanquished. The Khumalos returned to peace in their ancestral homeland. This peace lasted until Shaka asked Mzilikazi to punish a tribe to the north of the Khumalo, belonging to one Raninsi a Sotho. After the defeat of Raninsi, Mzilikazi refused to hand over the cattle to Shaka. Shaka, loving Mzilikazi, did nothing about it. But his generals, long disliking Mzilikazi, pressed for action, and thus a first force was sent to teach Mzilikazi a lesson. The force was soundly beaten by Mzilikazi's 500 warriors, compared to the Zulus' 3,000 warriors (though Mzilikazi had the cover of the mountains). This made Mzilikazi the only warrior to have ever defeated Shaka in battle. Shaka reluctantly sent his veteran division, the Ufasimbi, to put an end to Mzilikazi and the embarrassing situation. Mzilikazi was left with only 300 warriors who were grossly outnumbered. He was also betrayed by his brother, Zeni, who had wanted Mzilikazi's position for himself. Thus Mzilikazi was defeated. He gathered his people with their possessions and fled north to the hinterland to escape Shaka's reach. After a temporary home was found near modern Pretoria, the Ndebele were defeated by the Boers and compelled to move away to the north of the Limpopo river. Mzilikazi chose a new headquarters on the western edge of the central plateau of modern-day Zimbabwe, leading some 20,000 Ndebele, descendants of the Nguni and Sotho of South Africa. He had invaded the Rozwi state and incorporated some of the Rozvi people (many joined the Ndebele Nation voluntarily because it would offer them protection from their enemies). The rest became satellite territories who paid tribute to the Ndebele Kingdom. Mzilikazi called his new nation Mthwakazi, a Zulu word which means something which became big at conception, in Zulu "into ethe ithwasa yabankulu." Europeans called the territory "Matabeleland." Mzilikazi organised this ethnically diverse nation into a militaristic system of regimental towns and established his capital at Bulawayo. He was a statesman of considerable stature, able to weld the many conquered tribes into a strong, centralised kingdom. In 1852 the Boer government in Transvaal made a treaty with Mzilikazi. However, gold was discovered in Mashonaland in 1867 and the European powers became increasingly interested in the region. Mzilikazi died on 9 September 1868, near Bulawayo. His son, Lobengula, succeeded him as king. In exchange for wealth and arms, Lobengula granted several concessions to the British, the most prominent of which is the 1888 Rudd concession giving Cecil Rhodes exclusive mineral rights in much of the lands east of his main territory. Gold was already known to exist, so with the Rudd concession, Rhodes was able to obtain a royal charter to form the British South Africa Company in 1889. Lobengula established a state that held sovereignty over the region between the Limpopo and Zambezi rivers to the north and south, and between the desert of the Makgadikgadi salt pans to the west and the realm of Shoshangana to the east, the Save River. Rhodes negotiated a territorial treaty with Lobengula, known as the Rudd Concession of 1888, which permitted British mining and colonisation of Matabele lands between the Limpopo and Zambezi rivers, and prohibited all Boer settlement in the region. As part of the agreement, the British would pay Lobengula 100 pounds a month, as well as 1,000 rifles, 10,000 rounds of ammunition, and a riverboat. Lobengula had hoped that the Rudd Concession would diminish European incursions, but as white settlers moved in, the British South Africa Company set up its own government, made its own laws, and set its sights on more mineral rights and more territorial concessions. The social organisation of the Ndebele people was rigidly controlled by rules of service and hierarchy inherited from Shaka's reforms among the Zulu. Other subject peoples, such as in Mashonaland, were treated harshly; their lives and property were subject to the King's control and could be disrupted at any time by raids or exactions of tribute. This was the scene presented to British Pioneer Column when they arrived in Mashonaland in 1890. In August 1893 Lobengula sent warriors down to Fort Victoria to reclaim the cattle the Shona had stolen from his people. Lobengula's warriors won the war and brought back home the stolen cattle. The British took this as a good opportunity to attack King Lobengula in the disguise of protecting the Shona. During this confrontation, a fight broke out between British and Matabele and thus began the First Matabele War. Hoping for a quick victory, Leander Starr Jameson sent his British forces to attack the capital KwaBulawayo and capture Lobengula. But rather than fight, Lobengula burned down his capital and fled with a few of his elite warriors. The British moved into the remains of Gubulawayo, establishing a base, which they renamed KwaBulawayo and then sent out patrols to find Lobengula. The most famous of these patrols, the Shangani Patrol, managed to find Lobengula, only to be trapped and wiped out in battle. The British soldiers were vastly outnumbered throughout the war, but their superior armaments, most notably the Maxim gun, proved to be too much for the Ndebele. In an attempt to reach a peace accord with the British, a band of Lobengula's warriors brought a large sum of gold to two British soldiers to be delivered to their superiors. The two soldiers instead decided to keep the gold for themselves and the incident went undiscovered for many months.Lobengula decided to escape,the last time he was seen crossing Shangani river. In March 1896 the Matabele revolted against the authority of the British South Africa Company, in what is now celebrated in Mthwakazi as the First War of Independence. After a year of drought and cattle sickness, Mlimo, the Matabele spiritual leader, is credited with fomenting much of the anger that led to this confrontation. An estimated 50,000 Matabele retreated into their stronghold of the Matobo Hills near KwaBulawayo which became the scene of the fiercest fighting against the white settler patrols, led by legendary military figures such as Frederick Russell Burnham, Robert Baden-Powell, and Frederick Selous. Hundreds of white settlers and uncounted Matabele and Mashona were killed over the next year and a half. The Matabele military defiance ended only when Burnham found and assassinated Mlimo. Upon learning of Mlimo's death, Rhodes boldly walked unarmed into the Matabele stronghold and persuaded the leaders to lay down their arms. This final uprising thus ended in October 1897 and Matabeleland and Mashonaland were later renamed Rhodesia. During the Umvukela wesibili, the main rebel group, Zimbabwe African People's Union (ZAPU), split into two groups in 1963, the split-away group renamed itself the Zimbabwe African National Union (ZANU). Though these groups had a common origin they gradually grew apart, with the split away group, ZANU, recruiting mainly from the Shona regions, while ZAPU recruited mainly from Ndebele-speaking regions. The Zimbabwe People's Revolutionary Army (ZIPRA) was a primarily Ndebele anti-government force, led by Joshua Nkomo, and the ZAPU political organization. Nkomo's ZIPRA trained and planned their missions in Zambian bases. However, this was not always with full Zambian government support. By 1979, the combined forces based in Zambia of ZIPRA, Umkhonto we Sizwe (the armed wing of the African National Congress of South Africa), and the South West Africa People's Organization (SWAPO) fighters was a major threat to Zambia's internal security.[why?] Because ZAPU's political strategy relied more heavily on negotiations than armed force, ZIPRA did not grow as quickly or elaborately as the Zimbabwe African National Liberation Army (ZANLA), but by 1979 it had an estimated 20,000 combatants, almost all based in camps around Lusaka, Zambia. The Gukurahundi (Shona: "the early rain which washes away the chaff before the spring rains") refers to the suppression by Zimbabwe's 5th Brigade in the predominantly Ndebele speaking region of Matabeleland, who most of whom were supporters of Joshua Nkomo and ZAPU. Robert Mugabe, then prime minister, had signed an agreement with North Korean President Kim Il Sung in October 1980 to have the North Korean military train a brigade for the Zimbabwean army. This was soon after Mugabe had announced the need for a militia to "combat malcontents." Mugabe replied by saying Matabeleland dissidents should "watch out," announcing the brigade would be called "Gukurahundi." This brigade was named the Fifth Brigade. The members of the Fifth Brigade were drawn from 3,500 ex-ZANLA troops at Tongogara Assembly Point, named after Josiah Tongogara, the ZANLA general. The training of the Fifth Brigade lasted until September 1982, when Minister Sekeramayi announced training was complete. The first commander of the Fifth Brigade was Colonel Perence Shiri. The Fifth Brigade was different from all other Zimbabwean army units in that it was directly subordinate to the prime minister's office, and not integrated into the normal army command structures. Their codes, uniforms, radios, and equipment were not compatible with other army units. Their most distinguishing feature in the field was their red berets. The Fifth Brigade conducted public executions in Matabeleland, victims were often forced to dig their own graves in front of family and fellow villagers. The largest number of dead in a single killing occurred on 5 March 1983, when 62 young men and women were shot on the banks of the Cewale River, Lupane. Seven survived with gunshot wounds, the other 55 died. Another way the Fifth Brigade used to kill large groups of people was to burn them alive in huts. They did this in Tsholotsho and also in Lupane. They would routinely round up dozens, or even hundreds, of civilians and march them at gunpoint to a central place, such as a school or a bore hole. There they would beat the civilians with sticks and force them to sing Shona songs praising ZANU. These gatherings usually ended with public executions. Those killed were innocent civilians, ex-ZIPRA guerrillas, ZAPU officials, or anybody chosen at random. ^  "Zimbabwe African National Union," Microsoft Encarta Online Encyclopedia 2008, accessed 30 June 2008. Archived 2009-10-31. ^ a b "Archived copy" (PDF). Archived from the original (PDF) on 2009-02-11. Retrieved 2009-02-11. CS1 maint: Archived copy as title (link) "Breaking the Silence, Building True Peace. A report on the disturbances in Matabeleland and the Midlands 1980–1989"
^ a b Nyarota, Geoffrey. Against the Grain. Page 134. Wikimedia Commons has media related to Ndebele. "The History of the Ndebele People".